PETALING JAYA: YNH Property Bhd expects within the next six months to start work on its proposed Menara YNH project on three acres next to the Shangri-La Hotel along Jalan Sultan Ismail, Kuala Lumpur. Although Kuwait Finance House Bhd (KFH) had two weeks ago aborted its plan to purchase one of the two office blocks at Menara YNH, YNH said it would proceed with building the project. KFH had early last year offered to buy a 50% interest of the office component of Menara YNH from YNH Land Sdn Bhd. YNH Land is a unit of Kar Sin Bhd, which in turn is a wholly-owned subsidiary of YNH Property. YNH head of corporate strategy Daniel Chan said the company was currently making some amendments to the project design to improve efficiency of tenant space by 10% to 15%. The green project, built according to specifications of the Green Building Index, will have total net lettable space of 1.5 million sq ft.
“We will be resubmitting the amended project plan for approval. The development order was obtained last December,” Chan told StarBiz. Chan said the project was within the company’s target and would be completed in five years. The project will have two 45-storey office blocks with 600,000 sq ft of net lettable space each to be built on top of a three-storey retail podium. The gross development value (GDV) of Menara YNH will be around RM2bil or averaging about RM1,500 per sq ft.
Chan said work on the retail podium would kick off first and would be completed within three years. A group of local and foreign investors had early last year signed a sale and purchase agreement for the 300,000 sq ft of retail space for RM300mil. YNH would keep its options open, he said, adding that various parties had offered to team up as joint-venture partners for the project or buy over the property. “We are optimistic of the project as its value has appreciated. When the project was first mulled three to four years ago, its GDV was only RM1bil but, today, its value has doubled,” he said. Before KFH, CapitaLand Ltd of Singapore had more than two years ago agreed to a 40% share in a joint venture with YNH for the project but the deal fell through over disagreement in the land cost. On prospects ahead for YNH, Chan said the Sitiawan-based property company had projects worth RM11bil over the next 15 to 20 years, and YNH also had unbilled sales of RM856mi from its existing projects that would be realised over the next three years. This year, the company has lined up project launches worth some RM3bil, including Menara YNH. The Fraser Residence KL mixed development, comprising serviced apartments, office and retail space, behind Renassisance Hotel with a GDV of RM550mil will be launched in June. Another mixed development, the RM900mil Kiara 163 (formerly known as D’Kiara Place) located beside Plaza Mont’Kiara, will also have serviced apartments, office and retail components. Chan said another prime project to look out for would be located on 100 acres near Resort World in Genting Highlands. 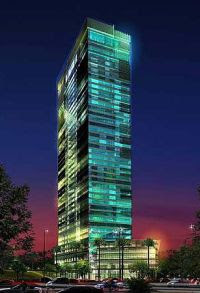 The mixed development with a GDV of RM2bil will be launched in 2011 for completion in 10 years. For the financial year ended Dec 31, YNH’s earnings should take a hit from the slow property market and deferment of project launches caused by the global financial crisis. “Next year (2010) should be a better year and we certainly look forward to a double-digit growth,” Chan added. DUBAI: Dubai is set to open the world's tallest building amid tight security on Monday, celebrating the tower as a bold feat on the world stage despite the city state's shaky financial footing. But the final height of the Burj Dubai - Arabic for Dubai Tower _ remained a closely guarded secret on the eve of its opening. At a reported height of 2,684 feet (818 meters), it long ago vanquished its nearest rival, the Taipei 101 in Taiwan. The Burj's record-seeking developers didn't stop there. The building boasts the most stories and highest occupied floor of any building in the world, and ranks as the world's tallest structure, beating out a television mast in North Dakota. Its observation deck - on floor 124 - also sets a record. "We weren't sure how high we could go," said Bill Baker, the building's structural engineer, who is in Dubai for the inauguration. "It was kind of an exploration. ... A learning experience"
Baker, of Chicago-based architecture and engineering firm Skidmore, Owings & Merrill, said early designs for the Burj had it edging out the world's previous record-holder, the Taipei 101, by about 33 feet (10 meters). The Taiwan tower rises 1,667 feet (508 meters). The Burj's developer, Emaar Properties, kept pushing the design higher even after construction began, eventually putting it about 984 feet (300 meters) taller than its nearest competitor, Baker said. He is keeping quiet about the exact height. Dubai's ruler will open the tapering metal-and-glass spire with a fireworks display Monday evening. Security is expected to be tight. Local newspapers quoted Maj. Gen. Mohammed Eid al-Mansouri, head of the protective security and emergency unit for Dubai Police, saying more than 1,000 security personnel, including plainclothes police and sharpshooters, will be deployed to secure the site for the opening. 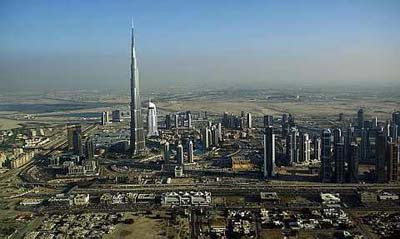 Work on the Burj Dubai began in 2004 and continued rapidly. At times, new floors were being added almost every three days, reflecting Dubai's raging push to reshape itself over a few years from a small-time desert outpost into a cosmopolitan urban giant packed with skyscrapers. By January 2007, thousands of laborers, many of them brought in on temporary contracts from India, had completed 100 stories. The finished product contains more than 160 floors. That is over 50 stories more than Chicago's Willis Tower, the tallest record-holder in the U.S. formerly known as the Sears Tower. It's also the centerpiece of a 500-acre development that officials hope will become a new central residential and commercial district in this sprawling and often disconnected city. That layout - as the core of a lower-rise skyline - lets the Burj stand out prominently against the horizon. It is visible across dozens of miles of rolling sand dunes outside Dubai. From the air, the spire appears as an almost solitary, slender needle reaching high into the sky. The Burj's opening comes at a tough time for Dubai's economy. Property prices in newer parts of the sheikdom have collapsed by nearly half over the past year. The city-state turned to its richer neighbor Abu Dhabi for a series of bailouts totaling $25 billion in 2009 to help cover debts amassed by a network of state-linked companies. Burj developer Emaar is itself partly owned by the government, but is not among the companies known to have received emergency cash. Emaar has said the entire Downtown Burj Dubai development, which includes the tower, will cost $20 billion to build. Sales of properties around the Burj are meant to help pay for the tower itself, which analysts say is unlikely to be profitable on its own. Jan Klerks, research and communications manager for the Council on Tall Buildings and Urban Habitat, which tracks world's tallest claims, said the building's real value might be that it is the "biggest city marketing campaign" Dubai could have come up with. "Put your name and that of the Burj Dubai on an envelope, and no postal service in the world will have problems delivering the mail," he said. SEREMBAN: A “Space City” project costing up to RM13bil, to be financed by a Dubai-based private pension fund from India, is set to take shape near here as early as the end of this year. The project will be similar, although not in size, cost and lavishness, to Abu Dhabi’s RM750bil Space City project that will be built over the next 10 years. The local Space City project will be built on 400ha near Bandar Sri Sendayan-Bandar Enstek near here, and close to the KL International Airport, Putrajaya, Cyberjaya and the Education Ministry’s RM1.2bil complex which will house several institutes and universities, according to Negri Sembilan Mentri Besar Datuk Seri Mohamad Hasan in an interview. “The ultra modern project will take shape in phases over 15 years ... among the tallest structures under the first phase will be a skyscraper over 40 storeys high which will be the tallest building in the state,” he said. “It is going to be built on a totally new concept and will be the nation’s most modern city. It is something that you don’t see anywhere else here,” he said, adding that the memorandum of understanding for the project would be inked in the middle of this year. He said the pension fund has agreed to the terms and conditions to buy the land from Mentri Besar Inc.
“We have negotiated a deal and everything is in order. In fact the investors were here recently for a due diligence and they were extremely happy with the way the project will be carried out,” he said, adding that the state government did not give the pension fund any incentives for the purchase of the property. The project, Mohamad said, would not be carried out on a joint venture basis between MBI and the pension fund. “We only sold them the land based on set conditions and they will be bringing the cash from abroad to finance it. We would not be forking out any cash for the project,” he said. Mohamad said he had also been briefed by the project’s London-based architects and US-based town planners on details of the project during a visit abroad recently. He added that the Space City would also house the Formula One City where competing teams would be able to set up their research and development (R&D) and other facilities. “They would no longer have to stay in Kuala Lumpur when they come here for the race. It can be taxing to have to commute between both points during the race, what more with the congestion in the federal capital,” he said. At present, these teams use helicopters to ferry their officials from Kuala Lumpur to the F1 track in Sepang. The first phase of the project would be a mixed development with residential and commercial properties. “The residential properties would cost more than RM500,000 and locals would be encouraged to invest here. In fact, the developers would also be allowed to sell these properties to foreigners,” Mohamad said. “What is certain is that the Space City project would help boost the property market here. In fact the former 513 Felda LBJ settlers who became millionaires after they sold their properties would be able to make a lot more if they decide to dispose of the 0.8ha we gave each family,” he added. The mentri besar said the Space City project would be carried out at the same time as Sime Darby’s Central Vision Valley (CVV) project located some 8 km away. The CVV project will be carried out on 3,000ha, comprising mixed development, sports and educational institutions. Mohamad said the proceeds to be raised from the sale of the 400ha would be used by the state government to repay loans taken from the federal government and the Pensions Trust Fund, some of which would mature this year. Property developer SP Setia Bhd, may build towers and buildings at the multi-billion ringgit Setia City commercial hub, its flagship township in Shah Alam, Selangor, by as early as 2012. 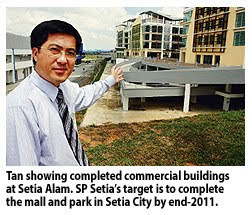 The 63.2ha Setia City will be developed in two phases. Phase 1 comprises the 1.23 million square ft Setia City Mall, worth RM750 million, and a central park, estimated to cost more than RM10 million. Phase 2 will feature more than 20 low- and high-rise buildings, including office towers, corporate towers, serviced apartments, institutions and hospitals. Bandar Setia Alam Sdn Bhd general manager Tan Hon Lim said the development of phase 2, which is still in planning stage, will commence pending market conditions and the completion of phase 1. "We have started earthworks for phase 1. Actual construction will commence in first quarter of the year. Our target is to complete the mall and park by end-2011," Tan said in an interview with Business Times recently, at Setia Alam. Bandar Setia Alam, a SP Setia unit, will build the mall with Lend Lease Asian Retail Investment Fund 2 Ltd in a 50:50 joint venture, on 12.2ha. Lend Lease is part of Lend Lease Corp Ltd, an Australian property group. Tan said Setia City Mall, which is SP Setia's first retail mall development will set the benchmark in sustainable retail development. He said it will be the first and only mall to be included under the Green Building Index's pilot accreditation scheme. Setia City Mall will house a department store, 250 local and international specialty stores, a number of major anchor retailers and an entertainment precinct. Tan said SP Setia is in talks with several local and foreign hospital operators to take up shop at Setia City. "We are also talking to institutions. We want Setia City to be a vibrant development with local and international presence," Tan said. Eastern & Oriental Bhd, Hunza Properties Bhd, SP Setia Bhd. and United Malayan Land Bhd had their ratings raised to “outperform” from “trading buy,” CIMB said in a report today. Hunza climbed 4.6 per cent to RM1.59, the highest level since August 14. SP Setia added 1.5 per cent to RM3.98. UEM Land Holdings Bhd gained 2.7 per cent to RM1.53.